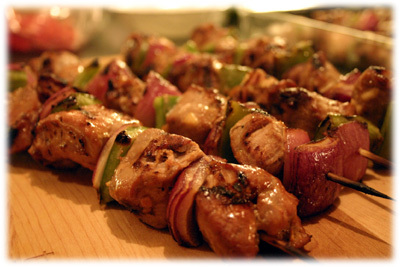 This spiced pork kebab recipe is very similar to the famous satay pork skewers served at many Thai restaurants. The big difference? After they're grilled you'll serve them on fresh panini rolls along with a rich peanut satay sauce and fresh herbs making them into pork kebab burgers! 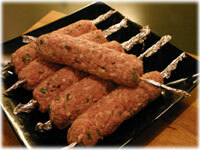 Combine the ground pork with garlic, ginger and fresh cilantro, shape into logs and thread on skewers before grilling. Place some fresh cilantro and basil on a sliced panini or hoagie bun, add the pork kebab and slip out the skewer and drizzle on some of the rich peanut satay sauce. Very unconventional burgers, but who cares - they taste great! 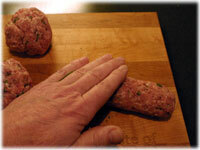 In a large mixing bowl add the pork kebab ingredients and with your hands mix them together so they're well combined. Form the meat mixture into 6 equal sized balls. Shape each ball into a log shape about 6" - 8" long. Rolling the log gently on your work surface helps form the log shape. Insert a bamboo skewer up the center of each log and wrap the ends of the skewers with foil to help minimize burning when grilling. 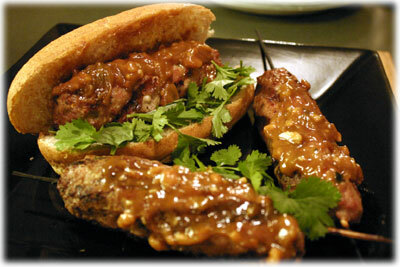 Cover and refrigerate while you make the peanut satay sauce. 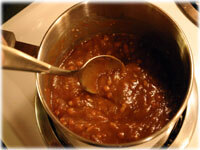 In a medium saucepan combine the peanut satay sauce ingredients over low heat. 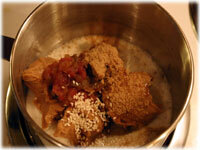 Stir the peanut sauce until it's heated through and all the ingredients are well combined. 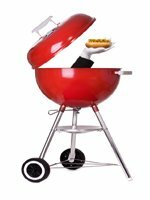 Preheat the grill to 475F - 500F direct heat cooking. 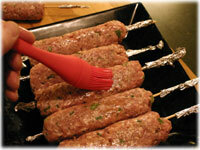 Lightly brush the sesame oil over each pork kebab. 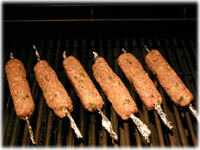 When the grill's reached cooking temperature place the kebabs on the grates. After several minutes roll each kebab over a 1/4 turn. Monitor them and continue to roll each one to ensure all sides are evenly cooked. After 10 - 12 minutes they should be cooked and have an internal temperature of about 160F. 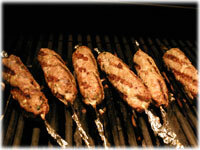 Remove the cooked pork skewers from the grill. 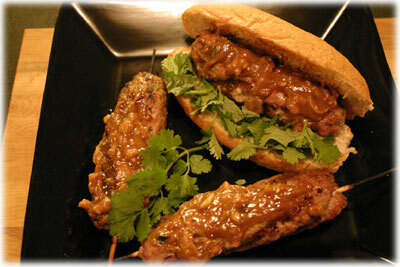 If serving as a kebab then drizzle some of the peanut satay sauce over each one. If making these as burgers then place some torn cilantro and basil in each panini roll, place a kebab on the herbs and drizzle with the peanut satay sauce.